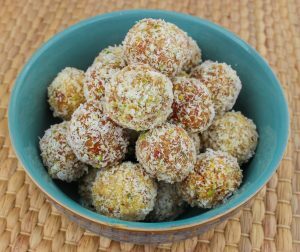 These bliss balls are high in iron and vitamin C and are perfect as a low calorie snack on the go or between meals. They will keep in the fridge for about a week. Using a food processor blitz the apricot and goji berries until finely chopped. Add the remaining ingredients and blitz until fully combined. Take a small amount of the mixure and roll it in your hand to form a ball. Take a small amount of desiccated coconut and roll the ball in it to coat entirely.